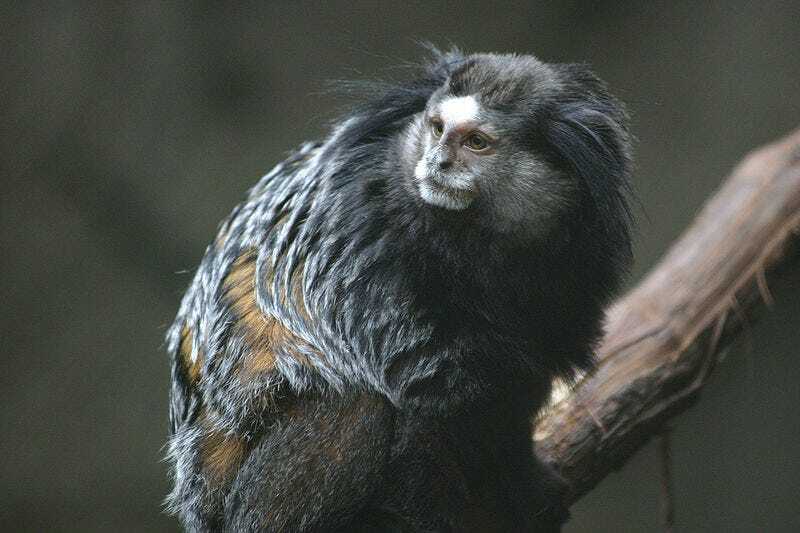 That marmosets can learn from other marmosets isn't all that surprising. Slightly more impressive is that they can learn from unfamiliar marmosets, who they haven't met before. But what's really amazing is they can learn from instructional videos. The researchers first trained two captured marmosets to get their treat out of the box in two different ways, either by popping open a lid or by pulling a drawer, and shot videos of the two monkeys' acquired behaviour so that they could serve as unwitting instructors. The team then took the same type of box to the forest and placed it on a tree branch, together with a laptop screen on which they showed either of the two instructional videos. Twelve groups of marmosets — 108 animals in all — got to watch either video or, to serve as controls, a still image showing the instructor next to the box. Only twelve animals managed to get the box open, but 11 of them learned how to do it by watching the video. What's next? Monkey workout DVDs? King Kong Academy? Just don't show them Planet of the Apes, okay?